American furniture designer, Dakota Jackson is known for his eponymous furniture brand, Dakota Jackson Inc., and his early avant-garde works involving moving parts or hidden compartments. Dakota Jackson was born in 1949 in NY, USA. Born to a family of professional magicians, Jackson grew up on stage, where he learned the extreme disciplines of the performer. He is a young man, is immersed in minimalist dance scenes and performance art resting in the abandoned lofts of Soho’s 70s. These experiences with the illusion and the show were informed of his design sensibility. 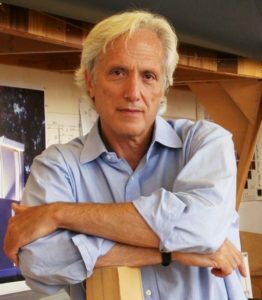 Notable among his projects is the Library Chair, designed for the public architecture of San Francisco by architect James Ingo Freed. Another work signature includes Jackson’s many collaborations with Steinway & Sons. In 2000, Steinway told the TriCentennial Piano, an edition of 300 pianos commemorating the three hundredth anniversary of the instrument’s invention. In 2013, Jackson and Steinway presented the Arabesque limited edition Grand Concert piano, which celebrates the 160th anniversary of the founding of Steinway & Sons. The Arabesque has been awarded a Red Dot Award 2014 for Innovative Product Design, a historic honor for Jackson that for Steinway is the first Steinway piano to receive the prestigious award. Today, Dakota Jackson and her family live in New York City. What About His Most Notable Works? In a career over four decades, Dakota Jackson has been one of the leading figures in American furniture design. Since the early 1970s, each of his seminal designs has been a combination of exquisite craft, intriguing engineering, and original form. Dakota Jackson furniture can be found in collections of the world’s leading museums, including The Cooper-Hewitt National Design Museum, Germany’s Deutsches Architektur Museum, The Brooklyn Museum, New York’s Museum of Art and Design, The Chicago Athenaeum, and The London Design Museum. Noteworthy among his designs is the Library Chair, currently in use in libraries across the country, including Harvard, NYU, Stanford. In 1991, Jackson began work on a chair for use in libraries and other educational institutions. Inspired by Bank of England-style office chairs, as well as by the plywood seating collections of Charles and Ray Eames, Jackson spent five years developing and testing his design for what became “The Library Chair” and one of his most ubiquitous works. 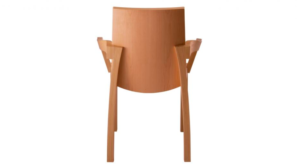 The Library Chair is characterized by maple face veneers on solid maple kiln-dried frame. Jackson wanted to engineer a strong, comfortable wooden chair that could be mass-produced cost-effectively. Connections are reinforced with dowels, mortise-and-tenon joints and sub-seat aprons. Each component is precision cut by a 5-axis robotic router, allowing for near zero tolerance in alignment and fitting of all joints. 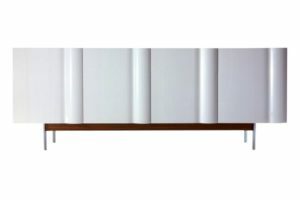 Another important work made by the American furniture designer is the Bump Wave Cabinet which challenges visual perceptions of weight distribution. The molded wooden doors, with their idiosyncratic “bumps” form a wave across the gleaming surface of the rectangular case. A band of contrast wood below the case offers a grounding element. 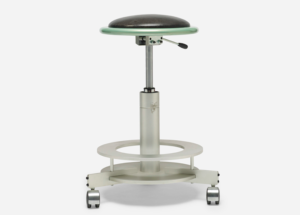 The “biomorphic” Vik-ter Chair was introduced in 1991. 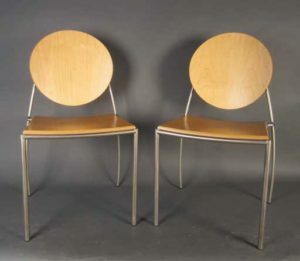 The chair’s “highly production oriented” design included a curving welded-steel frame and a tapered laminated cherry plywood seat that could be produced in seven minutes. The Vik-ter Chair was Jackson’s first design that could be mass-produced and priced competitively. It received a silver award for environmental design in the 1992 Industrial Design Excellence Awards. Although the Vik-ter Chair was designed for the contract market, its popularity led Jackson to make it available to the residential market and for sale directly to buyers. 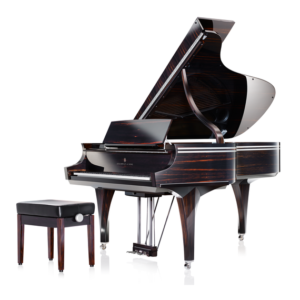 One of the most notable works designed by Jackson is the 160th Anniversary Arabesque Concert B Piano for Steinway & Sons. The stunning Arabesque is a Limited Edition with a unique and innovative design approach. “The Arabesque Piano combines the grace of the classical dancer and the intertwining motif witnessed in Moorish design — sound in movement. The physical presence of the Arabesque was a direct link to what I initially composed in my thoughts. It was a thought dream coming alive.” — Dakota Jackson. It touches the soul with a pure beauty. 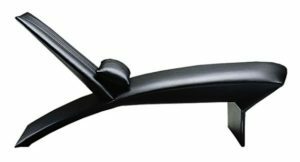 The instrument captivates with exquisite design accents, giving an impression of fluidity and movement. In ballet, an “arabesque” is a pose held suspended in time, with the limbs of the dancer impossibly extended. It conveys a sense of channeled energy, flowing freely through the tips of the fingers and toes, outward and upward into the ether. Dakota Jackson, known for modern high style and exquisite unparalleled craftsmanship, has been at the forefront of American design for nearly four decades. With collections spanning residential, executive, educational, and hospitality needs, he creates lasting works that will continue to inspire and serve for generations to come. More than anything, he is an inventor, a man who melds his prodigious creative, intuitive and technical gifts to build structures of lasting beauty. The creation of and passion for beauty and connection is a through-line for Jackson, who has a way of building pieces that people feel, interpreting the user and creating for them. A builder and tinkerer, a second-generation magician who toured with his father, a concert-level pianist and a dancer who performed with the Trisha Brown Dance Company, Jackson has led an amazing life, and his brain is a rapid-fire generator of ideas, connections, of one-thing-leads-to-another until somehow he finds his way back. His furniture pieces are in museums, and his list of awards is long. The many winding stories in his arsenal are fascinating. And it is of no surprise that his best ones involve women. “Women have been the ones who have challenged me in terms of the art and craft of what I do” he explains. Ke-Zu Chaise Lounge – In 1989, Jackson entered the mass-produced contract furniture market with the Ke-zu seating collection, which started with an “angular” chaise longue.